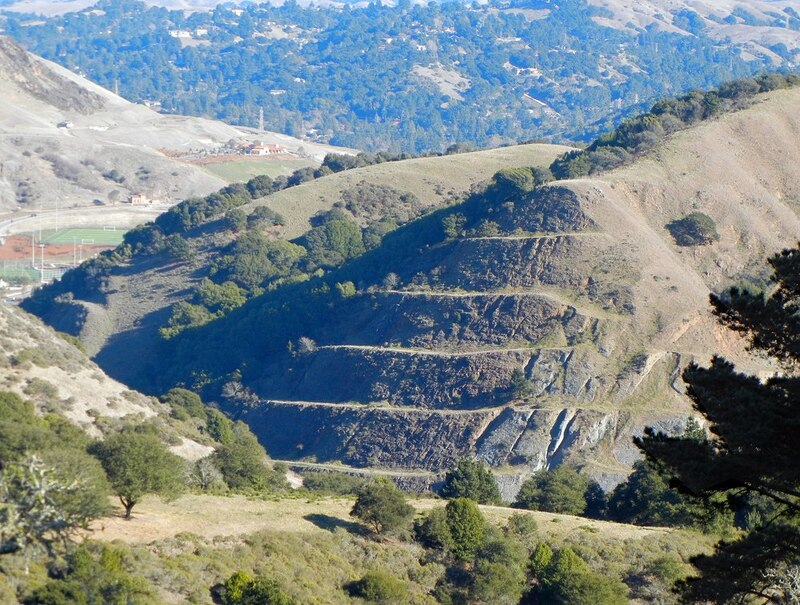 The basalt of the Moraga Formation is spectacularly exposed on both sides of Route 24 east of the Caldecott Tunnel. From along the highway you can get an excellent view of its makeup and structure, but this view from Radio Tower Hill shows how the rock unit makes up Gudde Ridge. Click the photo for the 1000-pixel verson. Gudde Ridge runs just east of Round Top all the way down to Canyon Road, on the back side of Moraga. The town of Canyon is on its west flank. And it’s Moraga basalt the whole way. In this photo you can see the underlying Orinda Formation to the right of the basalt. It’s gray conglomerate as opposed to the red-brown basalt. This entry was posted on 19 February 2012 at 5:41 pm and is filed under Oakland geology views, Oakland peaks, Oakland rocks. You can follow any responses to this entry through the RSS 2.0 feed. You can skip to the end and leave a response. Pinging is currently not allowed. My daughter is working on a project for school. She is in 5th grade and is interested in becoming a Geologist/Oceanographer. A section of the project requires interviewing someone in the field she is interested in. We have a list of ten questions that she needs answered and we were wondering if you would be kind enough to help us out. We have no one in our circle of friends or family that work in this particular field. If you choose to help us out, I have enclosed the questions that she has come up with. Thank you in advance for your help. 1. How does this career affect your personal life? 2. What are the most important college courses needed? 3. What traits are needed for this career? 4. What is your normal work routine? 5. How long are your work hours? 6. What do you like most about your job? 7. What do you like least about your job? 8. What is your specialty and have you been to any unusual or exotic places? 9. How old were when you started this career? 10. What is the starting salary for this career? Al, I’m not a professional geologist, but let me put the word out. I’m a geophysicist, which is similar to a geologist. Geologists look at rocks on the surface, and their tools are usually a hammer, a really good magnifying glass, and maybe some chemicals or scratchers of different hardnesses. Geophysicists try to understand the rocks below the surface that you can’t see, and use complicated tools (radar, electricity, metal detectors, sometimes even explosives). Geophysicists sometimes work on boats to try to figure out what rocks are below the ocean’s surface. If “geophysicist” sounds interesting enough, post a reply and I try answering your questions. Good luck! I am a geologist and I work on earthquakes. 3. What traits are needed for this career? You need to be creative, clever, hard-working and willing to change your mind. 4. What is your normal work routine? On a daily bases I work at the computer, some days I work in the lab (separating minerals, running lasers, etc), go to meetings or scientific discussions – that sort of thing. I go into the field 4-8 times a year, sometimes for a weekend, sometimes for 3 or 4 months. Then it’s a lot of different things like making maps, collecting samples, climbing mountains and digging holes. 6. What do you like most about your job? I get to travel, I get to make new discoveries, I can explore the world, I solve problems in creative ways and I can help society (in my case by understanding and communicating the risk from earthquakes). 7. What do you like least about your job? Making computer models! 8. What is your specialty and have you been to any unusual or exotic places? I am a tectonic geomorphologist, so I study the changes on the surface of the earth caused by tectonic forces (like earthquakes) and a paleoseismologist. A paleoseismologist studies ancient earthquakes. 9. How old were when you started this career? When I went to college it was for theatre, and my junior year I added geology as a major. (I was 20) My first real job as a geologist was 6 years later. 10. What is the starting salary for this career? It depends on what you do. If you go into mineral or oil exploration it’s higher than if you work as a professor or in a consulting firm. However, the salary is always very good, and the more education you have the higher your salary! And yes, I do visit exotic places. I’ve worked in India, Pakistan, China, Argentina and Bolivia, to name a few! Thank you Wendy . . . another USGS veteran, I see. And thank you Mika. Everyone please visit her blog! Finally, an appeal to girls to join the field. I haven’t really had much experience in this field, but i realize that good communication is always the key, as well as creativity/imagination/the ability to think out of the box. I learn to adapt in working areas full with boys. Right now I’m based in an office downtown, making reports and summary about geological history and oil & gas potential of an area. 8.30 – 17.30, Monday to Friday. Some of my colleagues get to go to remote areas for 2 days-4 weeks, maybe 4 times a year. Reading a bunch of very advanced scientific papers (most of it in english) sometimes makes me dizzy (because english is not my native language). I’m an oil & gas exploration geologist in a consulting firm, I review the oil & gas potential of a region. I’m currently based in an office downtown, but when i was studying in college, i get to go to many mountains/rivers/forests on remote areas in my country. 1. How does this career affect your personal life? I am married with two children, and as of now have not traveled very much. I currently work on a brownfield (around an operating mine) project in Salt Lake City, UT, so I am home every day. Being based in a large city such as Salt Lake means that I have a lot of opportunities to get out and enjoy many activities. 2. What are the most important college courses needed? I would say math (calculus) and your basic sciences (physics, chemistry) are key. 3. What traits are needed for this career? A sense of adventure, be hard working, passionate (about your career), and have a will to never stop learning. 4. What is your normal work routine? While working locally I work a 10 day on 4 day off schedule. When I have to travel for remote field work I typically work a 3 week on 1 week off schedule. 5. How long are your work hours? I normally work 8 – 5, but sometimes put in more hours when the workload dictates. 6. What do you like most about your job? The travel is awesome, but most of all I love looking at rocks everyday! 7. What do you like least about your job? I don’t think there is anything I don’t like about my job. If I had to choose one thing I liked the least it would probably be sampling drill core for lab analysis. 8. What is your specialty and have you been to any unusual or exotic places? My specialty is economic geology, which deals with the finding of ore deposits, and the recovering of said deposits from the Earth. I’ve yet to be anywhere terribly exciting, but being with a global company the possibilities are endless. 9. How old were when you started this career? 29 years old. I didn’t start my college education until I was 23. This makes me wish my kids had had blogs and the internet as outreach possibilities when they were young and in school! It was always a challenge to find people to interview for assignments such as this.